Two University of Colorado at Colorado Springs students have found their calling thanks to federal stimulus funds and a professor's resolve to offer courses in the increasingly lucrative field of energy engineering. Electricity meters at the Cameron Butcher building in downtown Colorado Springs. UCCS was among three area higher education institutions tapped by the city of Colorado Springs and Colorado Springs Utilities to take part in an energy efficiency study of local businesses. The $548,000 Energy Efficiency and Conservation Block Grant pays student interns to perform the audits and pays businesses to retrofit and implement the recommendations. Cameron Butcher, a commercial real estate group, is one of 12 businesses participating in the audit program to determine how to use resources efficiently. The semester-long internship has flicked on the career switch for mechanical engineering seniors Ted Geneva and William Rees. 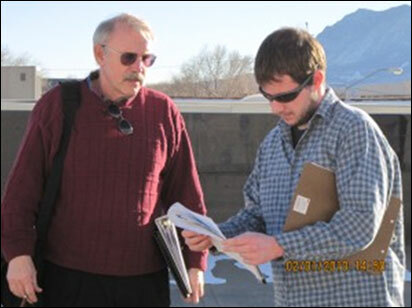 Glen Thieszen, an engineer from the Farnsworth Group Inc., oversees UCCS engineering senior William Rees' on-the-job training during the energy auditing internship. Geneva and Rees, along with peers from UCCS, the Colorado College, and Pikes Peak Community College, have been poking around heating and cool ducts, examining records, and conducting cost analyses for a dozen Colorado Springs businesses since January. They are making some remarkable discoveries. "I have learned that the vast majority of structures in Colorado Springs are over-lit and under-insulated," said Geneva, a senior set to graduate in 2011. Even more illuminating, he said, is how fired up he has become by the work. "I find myself waking up at 8 a.m. for some site visits and feeling fine about it," Geneva says. "I've never been a morning person and I can wake up early for this job." Timing also has been key for Rees. He, like Geneva, was urged last fall by his engineering instructor, Julie Albertson, to apply for the internship. The encouragement came at a critical juncture. "I needed to obtain actual engineering experience," said Rees, who graduates in December. He added that if this opening hadn't come along he might still be floundering. "This program has helped me narrow my goals." Albertson, senior instructor, Mechanical & Aerospace Engineering, not coincidentally, was teaching a class, Sustainable Energy Systems, at the time. "The whole concept of sustainability is important to me. It's something we need to educate our students about and it's why I created that course," Albertson said. Albertson's Sustainable Energy Systems is designed to ground students in the engineering, scientific and political principles of global renewable energy sources such as wind, biomass, solar and geothermal. The technical elective debuted in fall 2007 with a class of 12. When Albertson taught it a second time, last fall, enrollment doubled to 30. Fueled by student-interest, Albertson created yet another environmental engineering elective — Biomass Energy Analysis — to be offered for the first time this fall. The attraction to sustainable technology appears to be mirroring a green jobs explosion. Experts say a national energy crisis coupled with recent federal mandates that big cities obtain an increasing percentage of electricity from renewable resources is igniting the green job fields market. Small and medium-size start-ups, infused by millions of dollars from private investors and the federal government, are proliferating. Environmental engineers are in particular demand, according to the Green Research Council. Geneva says the on-the-job experience has already been invaluable: "I've honestly learned more working knowledge about energy saving measures and HVAC systems in two months working than I have ever learned from school." This is what Albertson likes to hear. A primary academic interest of hers involves developing methods to assist students in understanding the engineering world and steering them toward practical applications for their coursework. As such, Albertson jumped at the chance to assist Linda Kogan, director, office of sustainability, in coordinating university participation in the program. 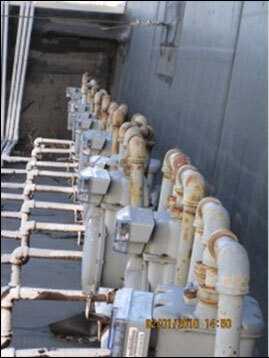 The energy audit program will end in May. So far, it's been a "great partnership" and a "win-win" for businesses, students, and educators, said Gail Connors, who directs the grant administration for Springs Utilities. It's too soon to say if a similar model might be offered again. Geneva, meanwhile, is already applying his newly acquired skills to a personal project. "I am in the design phase for a greenhouse for my mom's place in New Mexico," Geneva said. "I'm directly using calculations and knowledge I'm picking up at work to build something from scratch. I'll tell you, it feels pretty awesome."